Photo: Adele Goodman Clark Papers, Special Collections and Archives, James Branch Cabell Library. Emma Hart Willard founds the Troy Female Seminary in New York–the first endowed school for girls. Oberlin College becomes the first coeducational college in the United States. In 1841, Oberlin awards the first academic degrees to three women. Early graduates include Lucy Stone and Antoinette Brown. Sarah Grimké begins her speaking career as an abolitionist and a women’s rights advocate. She is eventually silenced by male abolitionists who consider her public speaking a liability. The first National Female Anti-Slavery Society convention meets in New York City. Eighty-one delegates from twelve states attend. Mary Lyon founds Mount Holyoke College in Massachusetts, eventually the first four-year college exclusively for women in the United States. Mt. Holyoke was followed by Vassar in 1861, and Wellesley and Smith Colleges, both in 1875. In 1873, the School Sisters of Notre Dame found a school in Baltimore, Maryland, which would eventually become the nation’s first college for Catholic women. Mississippi passes the first Married Woman’s Property Act. Female textile workers in Massachusetts organize the Lowell Female Labor Reform Association (LFLRA) and demand a 10-hour workday. This was one of the first permanent labor associations for working women in the United States. The first women’s rights convention in the United States is held in Seneca Falls, New York. Many participants sign a “Declaration of Sentiments and Resolutions” that outlines the main issues and goals for the emerging women’s movement. Thereafter, women’s rights meetings are held on a regular basis. Harriet Tubman escapes from slavery. Over the next ten years she leads many slaves to freedom by the Underground Railroad. Amelia Jenks Bloomer launches the dress reform movement with a costume bearing her name. The Bloomer costume was later abandoned by many suffragists who feared it detracted attention from more serious women’s rights issues. Former slave Sojourner Truth delivers her “Ain’t I a Woman?” speech before a spellbound audience at a women’s rights convention in Akron, Ohio. Harriet Beecher Stowe publishes Uncle Tom’s Cabin, which rapidly becomes a bestseller. The successful vulcanization of rubber provides women with reliable condoms for the first time. The birth rate in the United States continues its downward, century-long spiral. By the late 1900s, women will raise an average of only two to three children, in contrast to the five or six children they raised at the beginning of the century. The American Civil War disrupts suffrage activity as women, North and South, divert their energies to “war work.” The War itself, however, serves as a “training ground,” as women gain important organizational and occupational skills they will later use in postbellum organizational activity. Elizabeth Cady Stanton and Susan B. Anthony form the American Equal Rights Association, an organization for white and black women and men dedicated to the goal of universal suffrage. The women’s rights movement splits into two factions as a result of disagreements over the Fourteenth and soon-to-be-passed Fifteenth Amendments. Elizabeth Cady Stanton and Susan B. Anthony form the more radical, New York-based National Woman Suffrage Association (NWSA). Lucy Stone, Henry Blackwell, and Julia Ward Howe organize the more conservative American Woman Suffrage Association (AWSA), which is centered in Boston. In this same year, the Wyoming territory is organized with a woman suffrage provision. In 1890, Wyoming was admitted to the Union with its suffrage provision intact. The Fifteenth Amendment enfranchises black men. NWSA refuses to work for its ratification, arguing, instead, that it be “scrapped” in favor of a Sixteenth Amendment providing universal suffrage. Frederick Douglass breaks with Stanton and Anthony over NWSA’s position. Several women–including Virginia Louisa Minor, Victoria Woodhull, and Myra Bradwell–attempt to use the Fourteenth Amendment in the courts to secure the vote (Minor and Woodhull) or the right to practice law (Bradwell). They all are unsuccessful. Susan B. Anthony is arrested and brought to trial in Rochester, New York, for attempting to vote for Ulysses S. Grant in the presidential election. At the same time, Sojourner Truth appears at a polling booth in Battle Creek, Michigan, demanding a ballot; she is turned away. The Woman’s Christian Temperance Union (WCTU) is founded by Annie Wittenmyer. With Frances Willard at its head (1876), the WCTU became an important force in the fight for woman suffrage. Not surprisingly, one of the most vehement opponents to women’s enfranchisement was the liquor lobby, which feared women might use the franchise to prohibit the sale of liquor. A Woman Suffrage Amendment is introduced in the United States Congress. The wording is unchanged in 1919, when the amendment finally passes both houses. The NWSA and the AWSA are reunited as the National American Woman Suffrage Association (NAWSA) under the leadership of Elizabeth Cady Stanton. During this same year, Jane Addams and Ellen Gates Starr found Hull House, a settlement house project in Chicago’s 19th Ward. Within one year, there are more than a hundred settlement houses–largely operated by women–throughout the United States. The settlement house movement and the Progressive campaign of which it was a part propelled thousands of college-educated white women and a number of women of color into lifetime careers in social work. It also made women an important voice to be reckoned with in American politics. Ida B. Wells launches her nation-wide anti-lynching campaign after the murder of three black businessmen in Memphis, Tennessee. Hannah Greenbaum Solomon founds the National Council of Jewish Women (NCJW) after a meeting of the Jewish Women’s Congress at the Columbian Exposition in Chicago, Illinois. In that same year, Colorado becomes the first state to adopt a state amendment enfranchising women. Elizabeth Cady Stanton publishes The Woman’s Bible. After its publication, NAWSA moves to distance itself from this venerable suffrage pioneer because many conservative suffragists considered her to be too radical and, thus, potentially damaging to the suffrage campaign. From this time, Stanton–who had resigned as NAWSA president in 1892–was no longer invited to sit on the stage at NAWSA conventions. Mary Church Terrell, Ida B. Wells-Barnett, Margaret Murray Washington, Fanny Jackson Coppin, Frances Ellen Watkins Harper, Charlotte Forten Grimké, and former slave Harriet Tubman meet in Washington, D.C. to form the National Association of Colored Women (NACW). Mary Dreier, Rheta Childe Dorr, Leonora O’Reilly, and others form the Women’s Trade Union League of New York, an organization of middle- and working-class women dedicated to unionization for working women and to woman suffrage. This group later became a nucleus of the International Ladies’ Garment Workers’ Union (ILGWU). Theodore Roosevelt’s Progressive (Bull Moose/Republican) Party becomes the first national political party to adopt a woman suffrage plank. Alice Paul and Lucy Burns organize the Congressional Union, later known as the National Women’s Party (1916). Borrowing the tactics of the radical, militant Women’s Social and Political Union (WSPU) in England, members of the Woman’s Party participate in hunger strikes, picket the White House, and engage in other forms of civil disobedience to publicize the suffrage cause. The National Federation of Women’s Clubs–which by this time included more than two million white women and women of color throughout the United States–formally endorses the suffrage campaign. NAWSA president Carrie Chapman Catt unveils her “winning plan” for suffrage victory at a convention in Atlantic City, New Jersey. Catt’s plan required the coordination of activities by a vast cadre of suffrage workers in both state and local associations. Jeannette Rankin of Montana becomes the first American woman elected to represent her state in the U.S. House of Representatives. 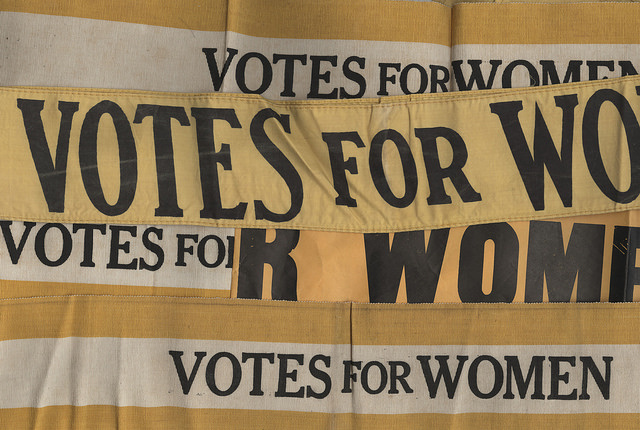 The Great War (World War I) intervenes to slow down the suffrage campaign as some–but not all–suffragists decide to shelve their suffrage activism in favor of “war work.” In the long run, however, this decision proves to be a prudent one as it adds yet another reason to why women deserve the vote. The Nineteenth Amendment is ratified. Its victory accomplished, NAWSA ceases to exist, but its organization becomes the nucleus of the League of Women Voters. The National Woman’s Party first proposes the Equal Rights Amendment to eliminate discrimination on the basis of gender. It has never been ratified. William H. Chafe, The American Woman: Her Changing Social, Economic, and Political Roles, 1920-1970; Nancy Cott, The Grounding of Modern Feminism; Thomas Dublin, Women at Work: The Transformation of Work and Community in Lowell, Massachusetts, 1826-1860; Sara M. Evans, Born for Liberty: A History of Women in America; Eleanor Flexner, Century of Struggle: The Woman’s Rights Movement in the United States, rev. ed. ; Debra Franklin, The Heritage We Claim: College of Notre Dame of Maryland, 1896-1996; National American Woman Suffrage Association (NAWSA) Collection, Rare Books Division, Library of Congress, Washington, D.C.; Anne Firor Scott and Andrew Scott, One Half the People: The Fight for Woman Suffrage; “From Parlor to Politics,” permanent exhibit at the Museum of American History, Smithsonian Institution, Washington, D.C.; and Dorothy Sterling, ed. We Are Your Sisters: Black Women in the Nineteenth Century. Zophy, Angela Howard and Frances M. Kavenik, eds. Handbook of American Women’s History.